Frank Renda is scared stiff he's losing his touch. It used to be easier: get a name, study the guy, walk up to him, pull the trigger. Simple. But now there's a certain Vincent Majestyk that Renda can't get out of his head. 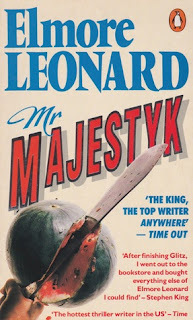 Majestyk's only a small-time melon grower and yet he's acting like he can't be bought. And then there's Nancy Chavez, a woman who likes to do a lot of things: but right now - unfortunately for Renda - it's fighting alongside Majestyk. Elmore Leonard was a master of the concise but powerful; famously in his dialogue, but also with his storytelling in general. This slimline novel is an intriguing and potent read that spans the border between Leonard's western tales (Three-Ten to Yuma, etc) and his later urban-based crime novels. Both chronologically and thematically. 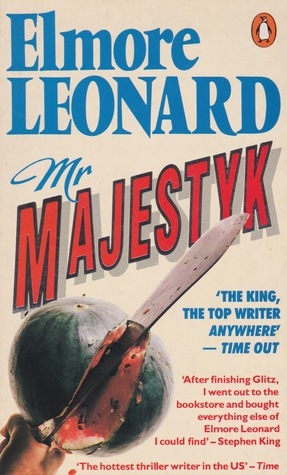 Originally published back in 1974 (I read a 1986 Penguin version, pictured), and turned into a film starring Charles Bronson, MR MAJESTYK is an action-packed and compelling tale of a war veteran who wants to lead a simple life farming melons in 1970s Arizona, but gets thrown in jail when a wannabe tough guy tries to muscle in on Majestyk's melon business. When he then gets caught up in the jail break of a mob hitman, Majestyk just wants to retreat to his farm and bring in his melon crop. Which is tougher to do when the law, local thugs, and the mob itself may also be gunning for you. There is definitely a western vibe to this crime novel, a man with a past trying to lead a simple life on the land, being harassed by local thugs and the law, trying to just do the right thing and live his life but also willing to take matters into his own hands when it comes down to it. Reluctantly, perhaps, but more than capably. I really enjoyed this read, devouring it in a night and a morning while travelling. A shorter, relatively simple tale that's very well told, and leaves you with memories of fascinating characters and plenty of action. It perhaps doesn't have quite the dialogue snap of Leonard's later books for which he became very famous, but the signs are there and overall this is a lesser-known gem among Leonard's oeuvre. Leonard takes us into the hard-bitten and dusty life of the pickers and growers living the agricultural bowl of the southwest of the US. The back-breaking work and sweating under the sun to make a living. Or a subsistence. There's an honourable independence to Majestyk, who is engaging and easy to follow along with even if he doesn't say very much. He's a tough guy who doesn't try to act like one - and doesn't care much for those that do. With little brushwork, Leonard has created quite a portrait, with plenty of depth for the reader to absorb without relying on lots of introspection. With very few words, Leonard makes his characters, settings, and this tale come to vivid life.